Worth 7-Piece Garden Tool Set is perfect for all gardens and indoor plants. 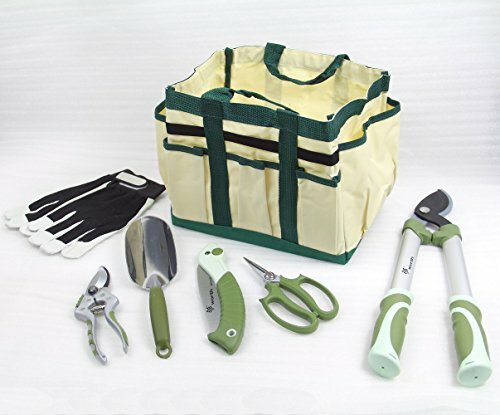 The durable garden tote bag with 6 pockets can hold the tools securely in place and the pockets are deep enough so that the tools won't just fall out. The 9.5 inches nylon work gloves are made of leather palms and spandex materials, offering great protection and more flexibility for hands during gardening activities. The 5 hand tools includes: mini pro bypass lopper, flower scissor, folding saw, aluminum trowel and bypass pruner. The 18 Inches bypass lopper is made of quality alloy tool steel blade and oval aluminum alloy tube handles, containing 1 1/4 inch cutting capacity. Folding saw is made of SK5 steel blade and features a safety lock. With the cast aluminum and mirror polished surface head, the trowel is ideal for digging or turning up soil. The 8 Inches deluxe bypass pruner is built with quality SK5 steel blade and cast aluminum handles. The flower scissor is designed with quality alloy tool blades. The durability of aluminum combined with great PVC hand grips makes these 5 hand tools pragmatic for a variety of garden work.